Far Cry games are known for putting players in the role of a person who finds himself trapped in an isolated area that's under the thumb of a despotic and maniacal leader. 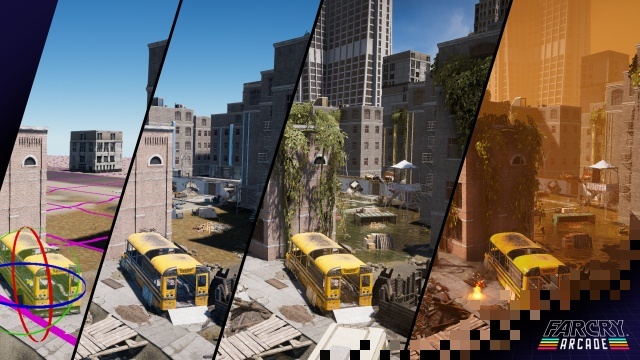 Far Cry 5 stays true to the series' themes, but it's also in ways different, and those differences begin with its setting. Rather than taking place in a far-off land, Far Cry 5 is set in Montana. The fictional Hope County is located within a valley surrounded by mountains in an isolated area of the state, so while it may not be thousands of miles from home for our protagonist, it may as well be. 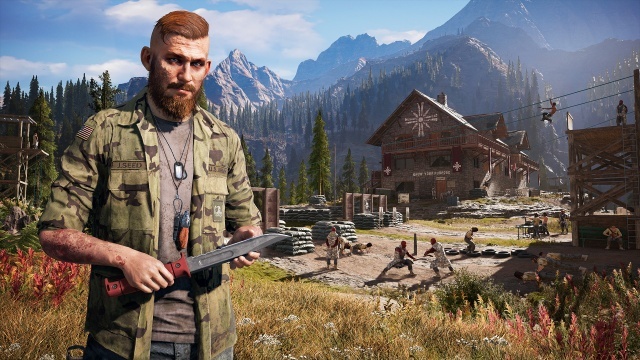 Hope County has come under the thumb of Joseph Seed and his cult, The Project at Eden's Gate. When Seed first arrived he appeared to be a preacher, but soon people began disappearing only to resurface living in Seed's compound. Through a combination of intimidation and the use of a mysterious drug called Bliss, Seed manages to take control of Hope County and attract the attention of the Feds. You are a Deputy Marshal sent to Hope County to arrest Seed and bring him back for trial. Seed initially cooperates, but things quickly go south and before you know it you're running for your life through the woods with Seed's followers on your heels. Completely cut off from the outside world, you'll need to work to release Hope County from Seed's grip and take down the cult leader himself if you're to have any hope of leaving Hope County again. You won't be able to face Seed until you can weaken his cult, and to do that you'll need to free the areas of Hope County that have been divided between three of Seed's relatives: John, Jacob, and Faith, but you won't be facing this daunting task alone. First of all, there is an active resistance against the cult operating in Hope County. The more you do to weaken the cult in an area, the more the resistance grows in strength, which means more guns on your side. And then there are the guns for hire. Some of the people you rescue or meet as you free Hope County can be hired to join you and fight by your side. You'll be able to give them basic commands in a battle, telling them to move to a location or to target a particular enemy. Each one has a specialty, so telling a sniper to take out an enemy will have a different result than if you give the same order to one carrying an RPG. You can have one gun for hire active at a time (two if you purchase a perk) and keep up to three on your roster. Each gun for hire will unlock two special skills when they reach certain kill thresholds, but you won't be able to see what those will be in advance. You'll also meet some characters in the game who will be available as specialist guns for hire. These characters have a higher degree of skill than the regular guns for hire, as well as some unique attacks. For example, one wields a compound bow and makes an excellent ally when stealth is important, while another will protect you from above in a plane and can rain down bombs on targets that you designate. There are even fangs for hire, like Boomer the dog and Cheeseburger the bear. Don't bring Cheeseburger along when you're trying to be subtle. The fangs for hire is a fun addition to the game, even though I found that I preferred to have the human characters at my side for the most part. 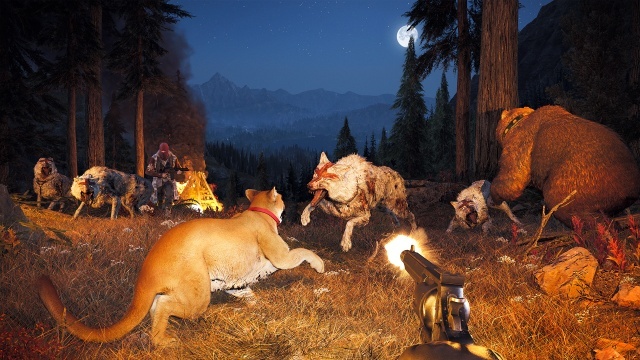 Those of you who prefer to hunt animals, a big part of Far Cry games past, may be a little disappointed in the changes that Far Cry 5 brings to hunting. Animal pelts are no longer required to craft things like bags to carry more ammo, everything like that has been relegated to the game's perk system. Killing animals of each species will earn you perk points in the game's objective system, but beyond that there's not much motivation to hunt. Your kills will result in pelts that can be sold for money or hunks of meat that can be used to lure predators, but hunting is not a lucrative activity given the time it takes versus the money you'll earn by selling pelts and such. Personally, I wasn't too disappointed in this change as it felt a little odd to me to be taking part in reducing the remaining population of America's endangered species. Hope County, Montana is an open world environment, and once you liberate the small island that serves as the game's tutorial zone you're free to go wherever you'd like. You can pick one of the three family-controlled zones and stick with it until it's completely liberated, or you can roam the entire county causing mayhem and being a general thorn in the side of the cult. But wherever you choose to go, Hope County, Montana looks spectacular. The team behind the game has created a remarkable simulation of Montana, from the geography to the flora and fauna. Look carefully and you'll see that the forest on south-facing mountain slopes differs from that on north-facing slopes or that prevailing wind patterns have shaped the growth of plants in some areas. Far Cry 5 also does a thorough job of filling Hope County with things for you to do, more so than previous Far Cry games. You still have the plethora of convoy-busting, base capturing side missions as before, as well as the random encounters with enemy patrols and roadblocks, but Far Cry 5 also includes plenty of side missions that actually feel like missions. You'll encounter local residents of Hope County that will need your help, and that help often goes far beyond simply attacking the local Eden's Gate base. Far Cry 5 doesn't funnel you through a series of story missions and leave you on your own killing time between them. Rather it ties the story advancement to milestone achievements in weakening the cult in each of the three territories, so you can pursue whichever missions you'd like, or ignore them completely, and the story will progress on its own as you do so. It works really well in making you feel that you are driving the story and are not just along for the ride. Far Cry 5 introduces another change that helps to make the story your own, but I'm not sure it works as well. You create your own character at the beginning of the game, and can customize what you wear throughout the game, but your choices have very little impact on the game. Your character remains silent throughout, listening to what the diverse cast of characters has to say without ever offering a response. Sometimes I didn't even really notice, but at others it seemed odd to be the hero of Hope County without ever offering a word of encouragement to the locals. While I'm on the topic of things that struck me as a little odd in the game, I should mention that Far Cry 5 has plenty of moments of that trademark Far Cry humor. The odd part isn't the humor itself, but that it feels a little out of place in Far Cry 5 given the game's villain, storyline, and setting. Joseph Seed is arguably the strongest, most compelling villain in the series to date. I can see the philosophy and creed that he espouses actually appealing to people and drawing them to his cult, making him a very dangerous man in a very real-world way. Seed doesn't really need his Bliss mind-control drug, he has a power of persuasion that can win him a multitude of converts on its own. I feel that if Far Cry 5 played to the darker elements of the story exclusively, the story would have had a far greater impact than it did. Those complaints aside, I still had a great time with Far Cry 5. I feel like it is one of the better games in the series, and though it still occasionally suffers from the feeling of repetition inherent in Far Cry games past, that repetition wasn't as prevalent as it was before. 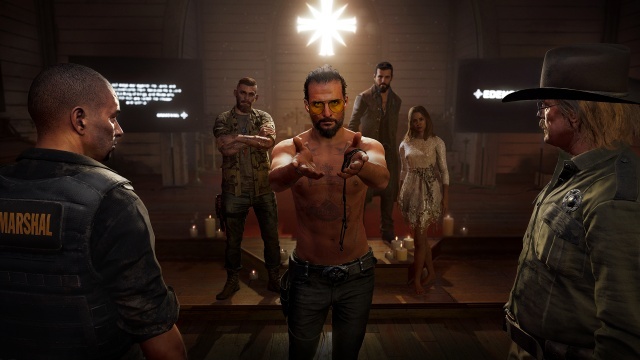 The freeform approach to the story was a great addition, and I really felt like Far Cry 5 opened up the freedom of the gameplay to a new degree for the series. I enjoyed the variety of missions offered up by the plethora of interesting characters residing in Hope County, and in directing the way the narrative played out. As for multiplayer, Far Cry 5 offers it in two ways. The first is through co-op play, which is of the full drop-in/drop-out variety. Progress is based on the host player's progress through the game, and missions completed in co-op are credited to the host player's game. When the guest player returns to their own game, Hope County will be just as they left it. Co-op play is enjoyable with a friend, and you can both bring your guns for hire along with you in your battles. The other mode where multiplayer gameplay is possible is the Far Cry Arcade. This is the user mod mode, which allows gamers to create and share both single player and multiplayer games. There's not a lot available at this point, pre-release, but what I've seen so far shows that Arcade is capable of delivering some pretty diverse gameplay experiences. On the single player side, I've played a mode that had me escaping from a house that was stuck somewhere between the Twilight Zone and an M.C. Escher work and a mission that tasked me to kill a VIP hiding in an industrial complex that played as a combination of shooter level and puzzle. Multiplayer games included a team deathmatch mode played on a tropical island map. It was nothing that would give Call of Duty a run for its money, but it was really enjoyable in an Old School shooter kind of way. One thing about Arcade mode that I'm not really sure about is that it shares the perk system with the single player campaign mode. Perks you purchase while playing through the campaign are applied to any Arcade mode games that you play as well. You can also earn perk points while playing through Arcade mode. On the one hand you can have an advantage over other players in Arcade matches if you've completed the game first, while on the other you can beef up your campaign player without earning those perk points fighting Seed. I've always enjoyed playing Far Cry games, but Far Cry 5 is probably my favorite. It has a few flaws and some missed opportunities, but overall it takes the Far Cry formula that's worked in the past and improves upon it. If you've never really enjoyed Far Cry games in the past, then those improvements may not be enough to change your mind about the game. However, anyone who's a Far Cry fan, or anyone who has yet to experience a Far Cry game will probably really enjoy their time in Montana. Final Rating: 90% - Far Cry 5 creates the series' most diabolical villain and brings him closer to home than ever before.